Last week, we talked about how important it is to make your investment planning decisions simultaneously with your tax planning decisions during this critical phase in your life. Otherwise, it’s highly likely that you’re going to part ways with a lot more of your hard earned money in taxes over the course of your lifetime than you are legally required to pay. In this Retirement Coach Strategy of the Week, let’s talk about another very important reason why you want to give careful thought as to “where” you’re going to hold your different styles of investments in your retirement years. As a brief warning, I will admit that this gets a little technical, but I think it’s worth knowing if you want to reduce your tax burden and keep more of what you’ve worked so hard to save. In order to illustrate this, let’s briefly discuss the IRS Required Minimum Distribution (RMD) rules on your IRA. Within guidelines, you can deposit money to your IRA (or company sponsored 401(k), 403(b), or 457-MA Deferred Compensation Plan) and defer all income taxes on the growth of that money until you make a withdrawal. The second rule that you must follow is that beginning in the year that you turn 70 ½, the IRS requires you to withdraw a certain amount from your IRA (Required Minimum Distribution) and pay income taxes. The amount you must withdraw is based on the value of your IRA and your life expectancy. For obvious reasons, this rule is in place is to make sure the federal government gets their tax money back! Here’s the key point: whether you “need” the money to spend or not, they force you to withdraw and start paying taxes on the money you’ve saved. This is where the problem comes in. What if they require you to withdraw $80,000 from your IRA this year, but you only want to withdraw $40,000 for your supplemental income needs? You probably already know the answer: you have to withdraw and pay taxes on all $80,000! Knowing this, if you’ve done your planning correctly, and you know that you’re not going to “need” to withdraw as much from your IRA at age 70 ½ as the IRS is going to “require” you to withdraw, what can you do about it? Well, this loops back to last week’s Strategy and why it’s so important to simultaneously understand the tax implications when you make investment decisions, i.e. “where” you’re going to place different styles of investments. As we did in last week’s Strategy, let’s make the assumption that you know the investment rate of return that you must earn (huge point), and that you’ve crafted your investment allocation to produce that return you need to earn among stocks, bonds, money markets, etc. Assuming that half your money is in tax deferred accounts (IRA, 401(k), 403(b), etc. ), and the other half of your money is not, “where” should you hold each style of investment (i.e. stock funds, bond funds, etc.)? If we make the assumption that your stock funds will grow much faster over the long run than your fixed income funds, is it better to hold your stock funds inside or outside of your IRA? The answer is outside your IRA! But, as opposed to the reasons outlined in last week’s Strategy, this time, it’s for a potentially different reason. If you position the stock portion of your investments inside your IRA, and long term historical results continue, your IRA may be a lot bigger at age 70 ½ and beyond than if you had allocated your fixed income investments inside your IRA instead. If the balance of your IRA is bigger, you may be required to withdraw more and more each year. And, the more you have to withdraw, the bigger your tax bill will be! No. What I’m saying is that if you’re going to hold some of your money in stock investments, and some of your money in fixed income investments, given the choice, holding your stock investments outside your IRA may lead you to pay significantly less in taxes. As I stated at the beginning, this is a little technical, but if you follow the logic, it could mean big tax savings for you over the rest of your life. P.S. : HELP spread the news! If you have a friend, family member, or co-worker who would enjoy receiving my Retirement Coach “Strategy of the Week”, please pass it on. 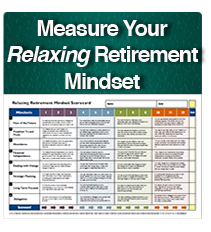 Simply provide their name and email address to info@TheRetirementCoach.com. Or they can subscribe at our website!